OK guys, here's the background I got, from a local historian, on the Carolina/Virginia combination. The pair were built for SR president Fairfax Harison. He had an estate west of Washington DC and basically used them for commuting. He would leave the headquarters building in Washington and retire to his quarters in the Virginia on friday evening and would be ferried to his estate during the night. Once there they would be parked on his private siding so that when he rose on saturday morning he was home. This process was reversed on sunday evenings so that he could be back in his Washington office early monday morning. The Carolina was required to run with the Virginia to serve as quarters for the hired help. There were certain perks associated with being a railroad president! The "Virginia" is indeed still in existance, and is still in use on the Norfolk Southern, along with its companion car, "Carolina." >I'm looking for the type, builder's date, builder, and location. Location - has been known to hang out at the NS offices in Roanoke, Va., though this may have changed since the Conrail acquisition. On several occasions I have found both the Virginia and the Carolina there, along with an assortment of other cars from both the N&W and SR in Roanoke, but I also know that many have been moved north to Altoona, Pennsylvania, where NS now maintains the business car fleet. -- Jerry M. LaBoda (laboda@bellsouth.net), July 17, 2003. I have a set of SR office car diagrams dated 2/15/1932. According to these diagrams the Virginia was built in May 19, 1928 by Pullman to diagram 28-F-95. 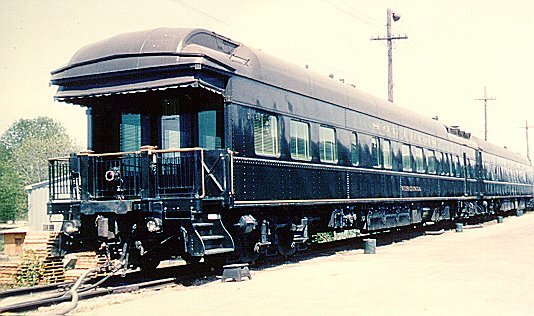 The all-steel heavyweight observation car was 1/4" short of 84'. Because of an extensive kitchen and dining area, it had a sleeping capacity of only 1 passenger and 2 porters and weighed 189100 lbs. By contrast, the "Carolina" had more state rooms and could sleep 6 passengers and 2 porters. -- Matt Bumgarner (stealthnfo@aol.com), July 17, 2003. If I recall correctly, Virginia and Carolina generally ran coupled together. When you saw them, you knew somebody really high up in the company was aboard (i.e., the Chairman of the Board). Also, is my memory correct that Carolina didn't have an open platform? -- Frank Greene (fgreen01@midsouth.rr.com), July 17, 2003. >Also, is my memory correct that Carolina didn't have an open platform? -- Jerry M. LaBoda (jmlaboda@bellsouth.net), July 18, 2003. The Virginia had a large lounge, large dining room, two bedrooms, one large one for the President and a small one for the secretary, with baths. The Carolina was an all bedroom sleeper with elaborate bath facilities. Thus, a fairly large group could use this two-car suite in relative comfort. They always travelled together, except in very rare circumstances. The silver service was marked for the car names. -- W. Graham Claytor III (kryt0n@aol.com), July 27, 2004.